I hope you’ll join us for four exciting exhibitions as we wrap up the spring semester here at Clough-Hanson Gallery on the campus of Rhodes College. 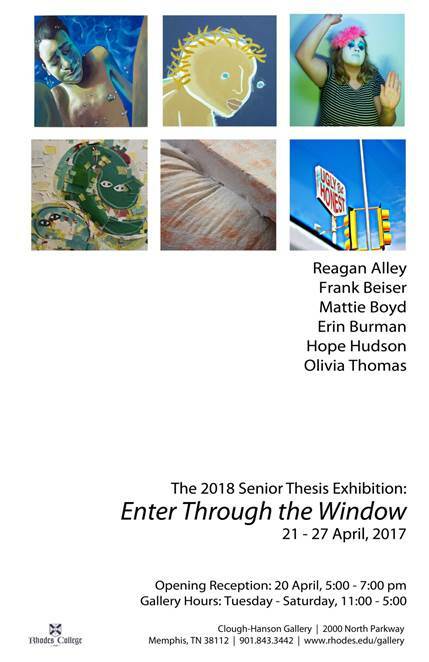 The Rhodes College 2018 Senior Thesis Exhibition, Enter Through the Window, opens with a reception in the gallery on Friday, April 20 from 5:00 – 7:00. It features the work of graduating seniors Reagan Alley, Frank Beiser, Mattie Boyd, Erin Burman, Hope Hudson, and Olivia Thomas. It will be on view through April 27th. Featuring Matthew Berry, Rev Neil Down, Christopher Owen, Terance Brown, Tad Pierson, and Shelby Payne. Organized by Frank Beiser. “Art & Space and Space & Art” is a collection of personal works including paintings, drawings, videos, and sculptures, all held in a recently finished gallery space. The show takes a comprehensive look at both the architectural and artistic sensibilities of the artists being shown. The art calls attention to the space, and the space calls attention to the art, revealing aspects of both that would have otherwise been left unseen. Featuring Grace Porter. Organized by Charlotte Sechrist and Casey Iskra. “I’ve Had Some Time to Think About It” is an exploration of memory. For Grace, her process is a chance to play, investigate, and absorb the world. Grace’s recent work touches specifically upon memory—how strong it is, how it is weakened over time, and the images and feelings that are stored away in one’s mind. Featuring Lauren Blair. Organized by Bonnie Whitehouse and Sarah Hatfield. “Text [subtext]” brings together a selection of works from Blair’s studio practice including photography, pastel works, and collage that Lauren Blair has produced over the past two years as they have begun their medical gender transition. Interested in the connections between transitioning and mental health, Blair has inspected their own experience and noted daily moods and actions on a series of calendars that become like abstracted, time-specific self portraits; snapshots of moments through a medical, but also deeply intimate and personal, transition.